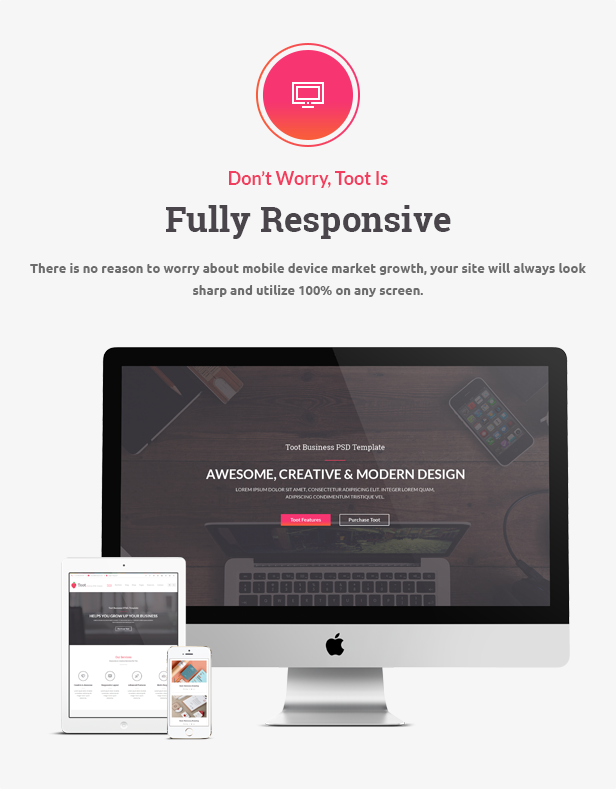 Toot is a clean and unique multi-purpose WordPress Theme for all kinds of sites & business. Featuring latest web technologies, enjoyable UX, beautiful design trends and based on Visual Composer designed with terrific attention to details, Usability & high performance. It is ultra professional, smooth and sleek, with a clean modern layout, for almost any need: Corporate Site, Ecommerce site, Photo Studio, Personal Blog, Shop, business companies, corporate agencies, organizations, creative designers and much more. 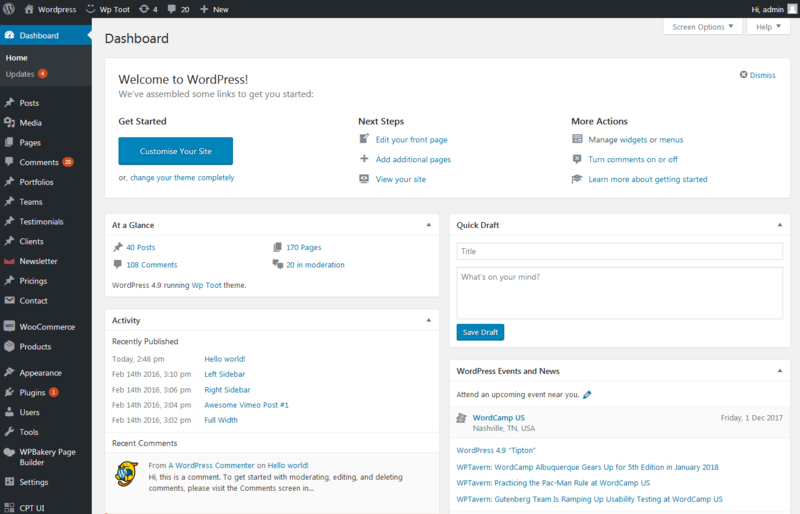 This WordPress Theme can easily satisfy all of your needs. With over 25+ Homepage Concepts ready to go or combine, build a layout has never been easier. There is a huge range of styled pages waiting for your customisation, anything you can think of can be built with Toot. If you are searching for innovative, modern and clean WP Theme, You should choose Toot. The WP files are fully layered and customizable and all elements are in groups and can easily identify by the group name as well. The site also uses heavy internal site linking, which is also of vital for search engines (related posts, primary and secondary navigation menus, footer navigation, etc) With this WordPress Template you are well equipped to get a high google ranking and attract visitors to show them your fantastic work! This is a responsive theme, able to adapt its layout to the screen size of your visitors. The Slideshows for this theme are also touch enabled and hardware accelerated, which means they are working super sleek on mobile device like ipad or iphone. Choose from collection of fluid CSS3 animations, carefully designed for a smooth and seamless experience. The drag-and-drop Visual Composer page builder for WordPress will save you tons of time working on your site content. you are able to create complex layouts within minutes! Build modern and responsive slider presentations quickly and with ease. 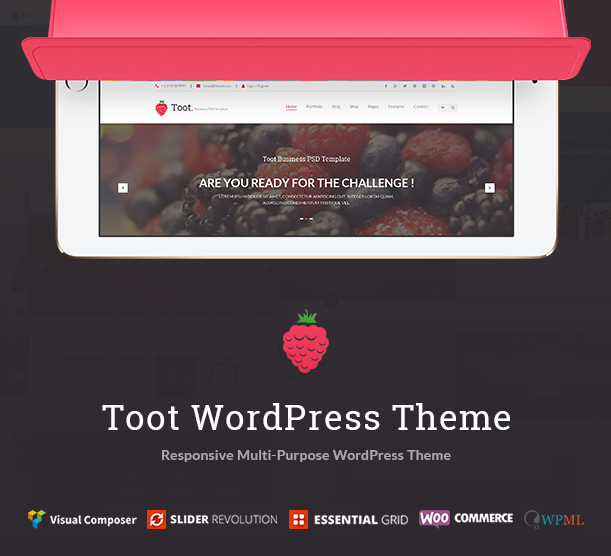 Toot theme comes with an extremely intuitive, easy-to-use admin interface. Add unlimited sliders and slides while you are editing pages/posts/portfolios, add unlimited portfolio images or videos while editing your portfolio items, add unlimited parallax sections to any page, customize typography styles, upload multiple logo versions, and much more. Take complete control over your website. Blog Layouts – Choose the best look for your blog. Toot Themes comes with a large collection of blog layouts, all carefully crafted and easy to add to any page. Add Custom Styles – No need to wallow through lines of code just to add your own custom css. Toot have embedded a custom css field in the theme Options panel to make your life easier. Retina Ready – It includes high resolution icons. With Themes your website will look awesome on high density Retina displays and high resolution screens. Fully Customizable Google Maps – Add Google Maps to your pages and customize their style to match your website aesthetic. Add multiple addresses and custom map pins. One-Click Demo Import – Import whole demo content, and set up your web site to look just like any of our demo examples in one click. WPML Ready – Fully compatible with the WPML multilingual plugin – create multilingual web sites. Professional and fast support – The support team is always ready and quick to help you! Thanks for watching! See the demo now at here!